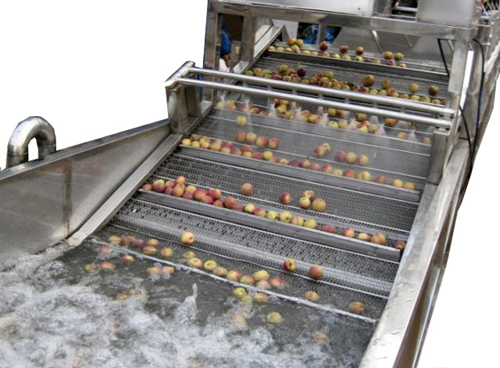 Fruit washing machine is used to clean fruits and vegetables massively. 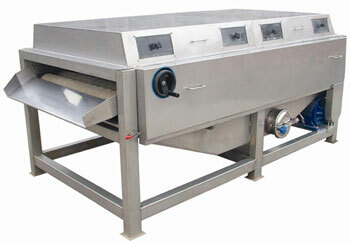 It is an important equipment for fruit pre-treatment, and ensures the cleanliness of raw materials and end products. It applies to various kinds of fruits, such as apples, oranges, tomatoes, mangoes, pineapples, lychees, kiwi fruits, etc. Generally, fruit washing machine can be classified into fruit bubble washing machine and fruit brush and spray cleaning machine. Fruit bubble washer machine mainly consists of hopper, tank, roller, turnover device, blower, spray water tube, etc. When the machine start work, the air flow from the blower keep the water in washing tank tumbling. During the water rolling, rapid flows scour the surface of raw materials and clear the impurities and chemical residues away. In this way, the fruit bubble washing machine can clean the fruits thoroughly without do any damage to the raw materials. 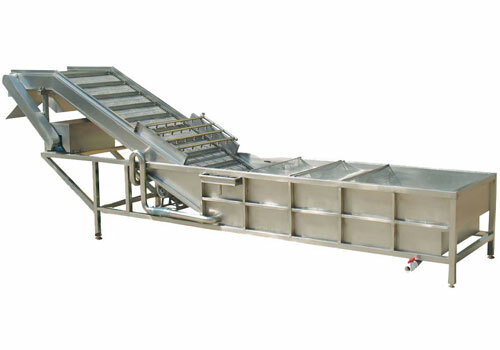 So it is especially suitable for cleaning fruits and vegetables, and plays an important role in juice processing line. With air flow and tumbling water, fruit bubble washing machine is able to clean fruits efficiently and keep the integrity of the raw materials. The control system integrate frequency scaling, seamless shifting and PLC automatic control, which can conveniently coordinate with downstream equipments. 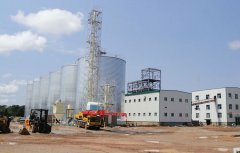 The production capacity ranges from 5 to 20 tons per hour. The operation is stable, and the noise level is lower than 80DB. The circulating water in the tank I can send raw materials to the elevator for the following process, and the washing water can be recycled after filtration. 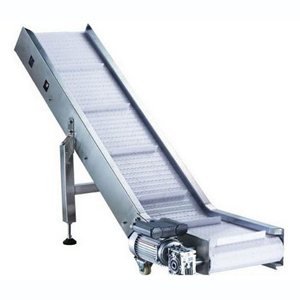 Fruit brush and spray cleaning machine is also called brush roller machine. It plays the same role as fruit bubble washing machine—eliminate the impurities and pesticide residues on fruits and vegetables. 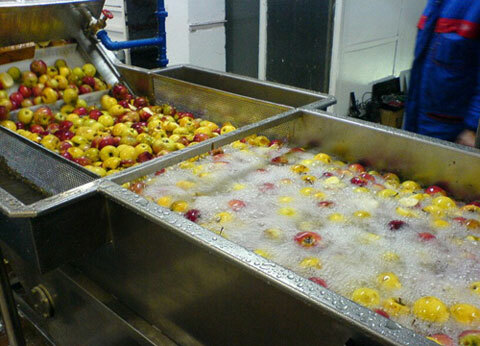 During fruit cleaning process, the brushing and spraying process is taken simultaneously. Equipped with rows of brushes, it can achieve higher level of cleanliness than fruit bubble washing machine. Fruit brush and spray cleaning machine is mainly constituted by water pump, brush, water tank, shield and rack. 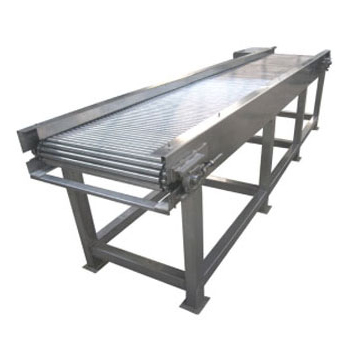 The rack, water tank, shield are made of 2mm stainless steel plate, while the transmission shaft and chain are mad of 1Cr13 stainless steel. It can achieve thorough cleaning effect with high pressure spray and high-speed rolling brush. 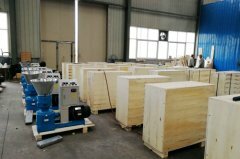 The height of the machine is convenient to adjust to fit various working condition. There is a water tank and filtering screen equipped in the fruit brush and spray cleaning machine, which can pump water into the tank and filter the stains as the same time. 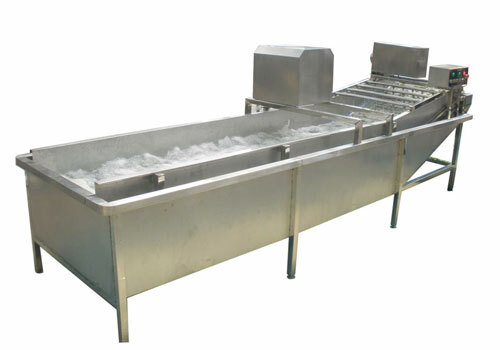 This fruit washing machine can be customized according to clients’ specific demand.